The Shy Guy Ship is an object that appears in Yoshi Topsy-Turvy. It appears as a large red ship with a skull-and-crossbones flag on top of it. 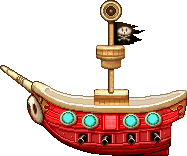 The bow of the ship has a Shy Guy mask on it while the stern has a small metal design. The ship is equipped with four small cannons and four circular windows. When the player tilts their Game Boy Advance system they will make the ship swing back and forth. The steeper the player tilts the system, the higher the ship's swing will be to the point where it can almost swing into a full circle. This page was last edited on January 29, 2018, at 17:03.